Don't be surprised if matching ramps/stairs show up for this at some point in the near future! Now on to clening up a few of the dimensions, page layouts, and adding the textures! 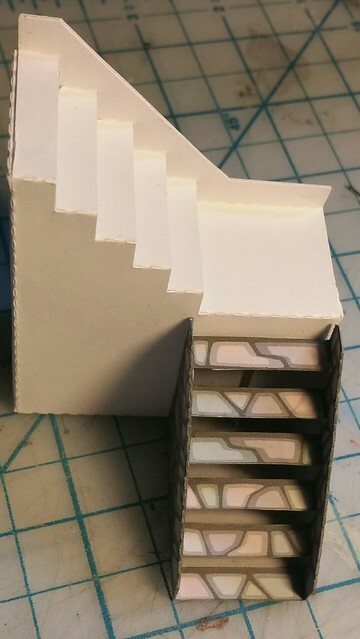 Working on getting the parts I have done into a consistent format and ready for PDF conversion, working on the Balconies at the moment. I have most of the building done already, so it is looking like I'll be able to do the work for the internal rooms as well before the official submission deadline! I think I'm almost ready to submit the Hiring Hall, I have pretty much all the major components completed, other than the 3" tall staircase with a landing and 90 degree turn to get from the ground floor to the second story. Totaling 25 pages so far, this includes ground tiles, interior floor designs, Double sided walls for the first and second stories, the interior balconies with staircases, the roof, and the front veranda/balcony... Going to work on the final staircase and fireplaces/chimneys and then use the weekend to do a final review of the pages, print and build, and take pictures ( including in-process pictures for a brief instruction book to highlight how to put together some of the more involved parts, like the interior balconies). I'm thinking people will like this as an addition to their collections! 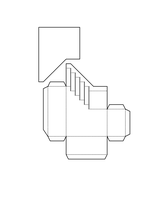 Here's a 3" version of the switchback, if that helps! 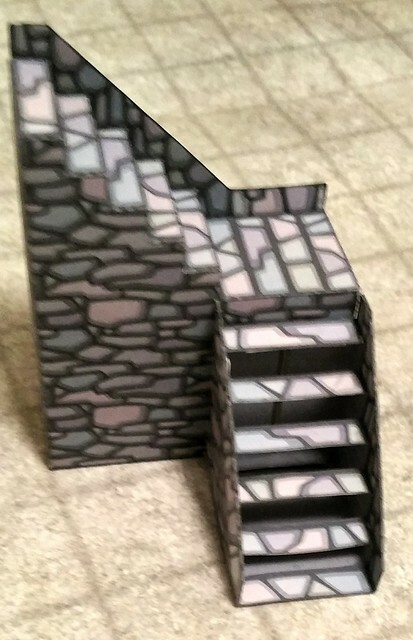 Thanks oldschooldm for the 3" switchback version of the stairs! That wilol help quite a bit. i'll still need to mod it a bit for the Higher rail design i want to use, and see about an open frame mod as well! Hmm. I just placed my new 3" switchback against my 3" popup and noticed that it has one more tread (at the 3" mark), and so the railing is 3.25" high, not 3.0", like the popup one. Should I fix that for everyone? I'm tempted to fix it. No rush oldschooldm, I think most peope here realize that you will end up fixing it at some point in the near future anyways! UPDATE: I replaced the original posted version with one with a smaller, 1" square landing. It looks better and takes up less space. Ha! I got it. 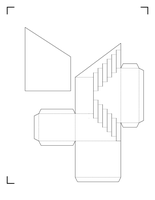 3" 90degree FOLD-FLAT second flight of stairs! 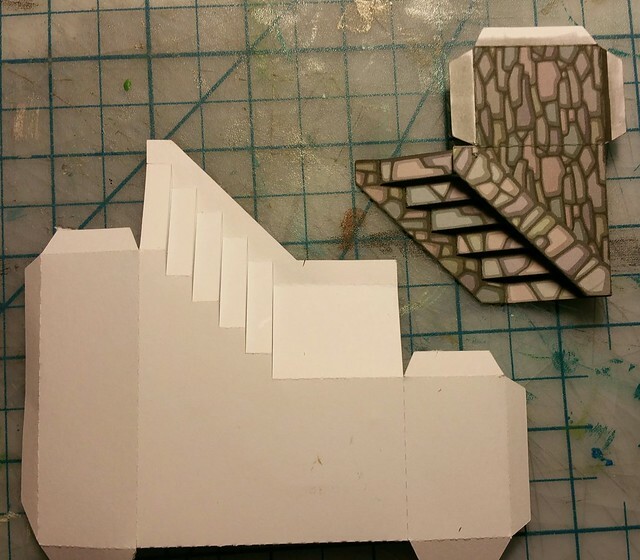 You build this, along with the 1.5" stand-alone model (from my entry) and either glue or pin them together! Viola! If you want a clockwise bend, just flip the image horizontally. 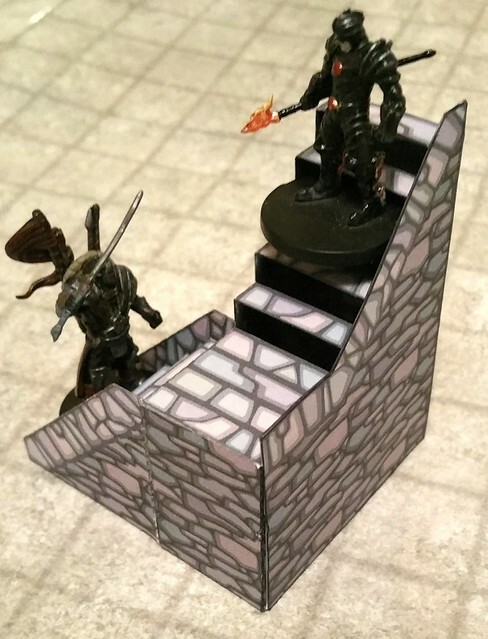 very nice oldschooldm! I think I'm going to have to use it, just to showcase a textured version! And we've got a sign! If anyone understands just how Public Houses/Inn's got their names, there is a bit of a background to the design. The Public house/Hiring hall was built on the sight of an older Inn run by a widow. Women who ran or manage inns were referred to as Ale Wives.. and the alewife is a fish in the same family as the herring.. When the new public house was built, it kept the sign that had survived the last fire before the new building was constructed, and due to its use as a hiring hall for men or even voyages, people using the new structure corrupted over time the name "Hiring Hall" and it is now known as "Herring Hell". 8 days until submission deadline, 30 pages done in Photoshop,, now to put together the PDF, print and assemble everything, and photograph during assembly for the instruction guide! Looks like I'm going to make it! Last Edit: Aug 23, 2015 7:44:49 GMT -9 by berneart76: Corrected number of pages.. had a few double-numbered, and had forgotten the ground tile for the Veranda! Getting done. I know that feeling. With my setback yesterday, I wasn't sure I could get caught back up and finish. Getting back to the point where finishing becomes a probability instead of a possibility is a great feeling. It's also a great feeling to realize you have stretched yourself to the point where you are hovering on that line. Thanks Vermin King for the encouragement! 31 Photoshop files completed 9 added one for some cross-bracing for the second story). 160 Layers exported for creating PDF's in Indesign... ( most pages have 3 layers, the walls have a few extras to allow for new walls, or soiled/cracked walls, and lit or unlit lanterns). 3 PDF pages completed. progress is looking good, I'll continue tomorrow and see how many of the PDF pages I can get created. This has definitely been an opportunity to stretch myself and work with different textures such as surface effects, shading and lighting. It is going to be a sense of relief and accomplishment getting this released, and providing people with a Inn/Public House environment large enough to actually have decent bar brawls in! I can't wait to see this it's gonna be so cool! I should be able to get the remaining 11 pages compiled tonight, and then tomorrow start with printing, cutting, assembling and photographing for the instructions! 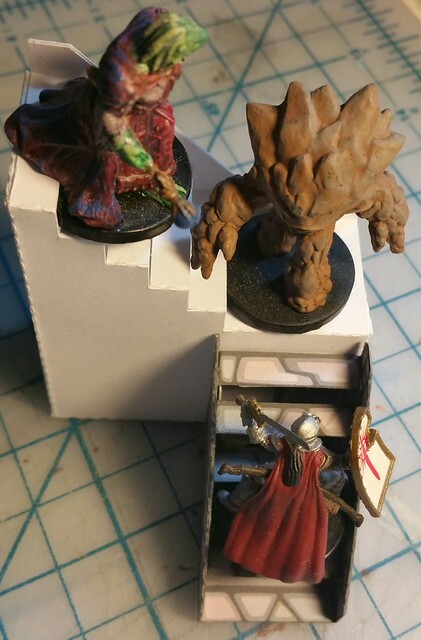 I also need to remember to try to get some white 110 lb cardstock, rather than the grayish tinted pack I got the last time, so the finished model is "brighter". PDF fully compiled except for the cover page ( waiting for a complete finished build for the photographs). All layers check out, 31 pages at 32 Meg.... Should be everything needed except for your personal choices in internal furnishings! Deadline approaching, build and photography going smoothly, Ground Floor ( including Balconies and staircases complete, but not the veranda/balcony yet) cut out, edged, folded, glued and assembled! I'm going to get this done yet! Large roof chimney fixed ( mostly) It sits better on the roof now at least. Will be taking time to catch up on housecleaning tonight, then looking to finish the build and work on instructions tomorrow, and then hopefully have my submission official by late Sunday or Monday..... ( really hoping for Sunday!). 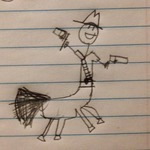 I might post the submission and then add the instructions later depending on how things go. 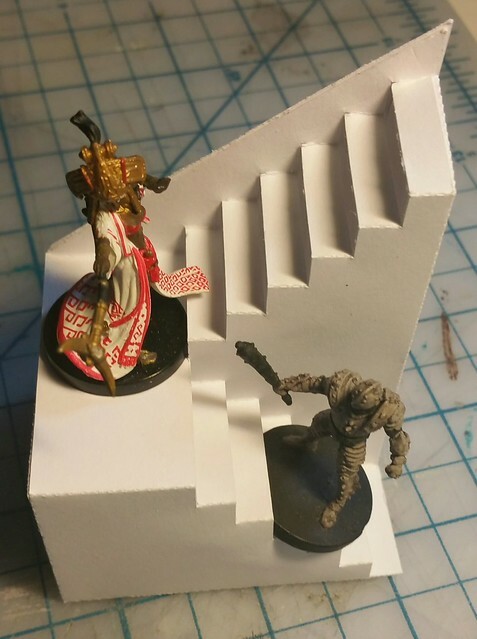 I finally updated the 3" Corner Staircase extension to have the same texture as my submission - thanks for inspiring this berneart76! And you already know it's fold flat! Since the Hiring hall preview seems to be rather popular, put a hold on the breakwaters/sandbars and working on the additional external textures for the Hiring Hall. Bit odd trying to find the correct files after 5+ months, but think I have the development files figured out. 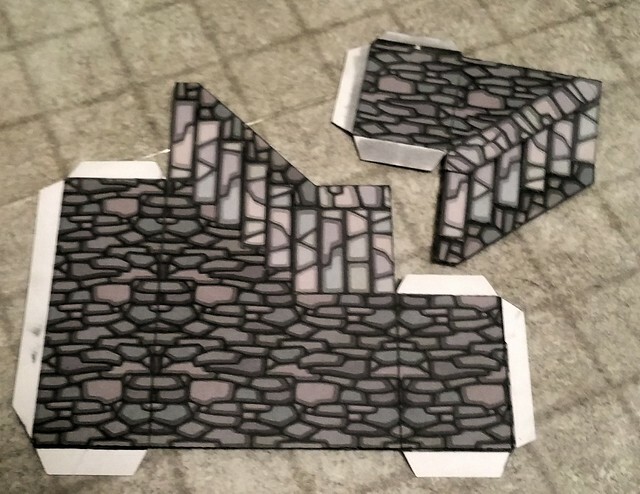 Here's the first test of the Grey Rough Ashlar (course split, not cut/carved) stone, using a texture I developed from pictures I took of an actual stone retaining wall. There will be a brown version of this as well. Have gotten a good start on the brown split ashlar as well. Thinking of doing a wood corner/top frame for this, as it will be needed for the Fieldstone versions.